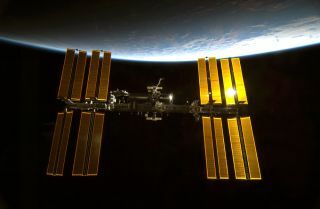 PARIS — The German Aerospace Center (DLR) on Oct. 4 said it had signed an agreement with Teledyne Brown Engineering of the United States to place the first commercial Earth observation payload on the International Space Station (ISS) in late 2015. The decision by Germany's space agency to be the inaugural customer for Teledyne's Multi-User System for Earth Sensing, or MUSES, platform is a long-awaited validation of space station backers' view that the orbital outpost, despite a less-than-ideal orbit and concerns about camera stability on the busy complex, will find an Earth observation market. DLR said its memorandum of agreement with Huntsville, Ala.-based Teledyne calls for DLR to develop a visual and near-Infrared imaging spectrometer for the MUSES platform, which can carry up to four separate observing instruments. The instrument will be used for land, ocean and atmospheric observation. Teledyne is developing MUSES as part of an agreement with NASA. DLR said the company is scheduled to deliver the platform to NASA in late 2014, and that the spectrometer should be in operation by late 2015. NASA awarded Teledyne a Cooperative Agreement in June 2012 for MUSES as part of NASA's broader effort to foster commercial use of the station. Germany is the biggest investor in Europe's involvement in the space station.